It was the Christmas gift that begat a thousand symphonies of bleeps, belches and barking dogs - and one of the best lo-fi samplers ever made! Casio was - and is - a manufacturer of inexpensive consumer goods. Best known for digital wrist watches and pocket calculators, it was something of a surprise when they entered the professional musical instrument market. Admittedly, their first - and most successful - pro instrument, the CZ-101, still looked a bit like a toy with its miniature keys and battery compartment around the back. Inside, though, was a thoroughly professional, multitimbral digital synth that shook up the industry, thanks in no small measure to its agreeable price. The company followed up with full-sized versions: the thoroughly pro VZ -1 synthesiser and FZ-1 sampler, the latter of which broke considerable new technological ground for a competitive - if not cheap - price. Yet the FZ-1 wasn’t the first sampler Casio had made. By that time, the world at large had been treated to countless Christmas singalongs to the backdrop of sampled flatulence, courtesy of the company’s questionably classic SK series of samplers. Unquestionably aimed at the novelty toy market, the SK series were small, battery-powered and chocked full of cheesy preset rhythm patterns and tinny synthesised tones. They were, quite obviously, the perfect plaything for driving your siblings into fits of giggles and grandparents into paroxysms of disdain and disgust. Still, toyetic though it may have been, Casio’s initial volley, the SK-1, was released at a time when sampling was very much in vogue among chart-topping musos, and the instruments upon which their hits were produced were lofty, unobtainable things with breathtakingly high price tags. 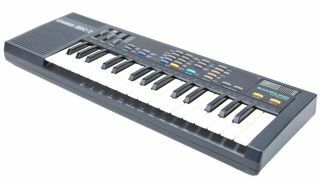 The contemporaneous Ensoniq Mirage may have been designed to put sampling into the hands of working musicians, but at £1695, it was still well out of reach of the bedroom boffin. For less than a hundred bucks, the SK-1 was available to nearly anyone who wanted to have a go with this fashionable new technology. So what could one get for less than a hundred smackers? Quite a lot, but not much at all. A full four voices could be played at once, but only one sound at a time - in addition to the preset rhythms. Samples were 8-bit (like the Mirage, and the Emulator before it), but the sample rate was a meagre 9.38Hz, meaning a very narrow frequency range. Sample length was limited to 1.4 seconds, but samples could be looped and envelopes imposed (13 presets shapes were offered). Samples were recorded either via the built-in microphone or a minijack line input. Further sounds were provided in the form of five preset PCM tones and a further three additive synth sounds. Portamento and vibrato were also on hand, as was a built-in 400-step sequencer. Memory was, alas, volatile. Used as a last resort at the time, the SK-1 was eventually embraced for its lo-fi sound – and because it was easy to modify. Something of a standard among circuit benders, SK-1s are often sold with elaborate add-ons. Designed to recapture the gritty magic of vintage samplers, TAL-Sampler allows you to ratchet down the fidelity in order to match that of old-school digital instruments like E-MU’s Emulator II and Akai’s S-series. Though even its lowest settings might make a Casio fan blush, like with the SK-1, its fast workflow makes it a lot of fun to use. It may not be a carbon-copy clone of the original SK-1, but this Windows-only one-off does capture the spirit of one specific - and beloved - sound from it: the 8-bit, PCM-based Human Voice patch. SK-crooner adds a resonant filter and reverb to the original’s vibrato. The envelope, meanwhile, is of the ADSR variety. Not a plugin, but rather a free set of samples encompassing all of the preset rhythm patterns and fills, alongside one-shot drum sounds. There are also 24 samples of the various synth sounds multisampled across octaves including the quirky piano, trumpet and more.